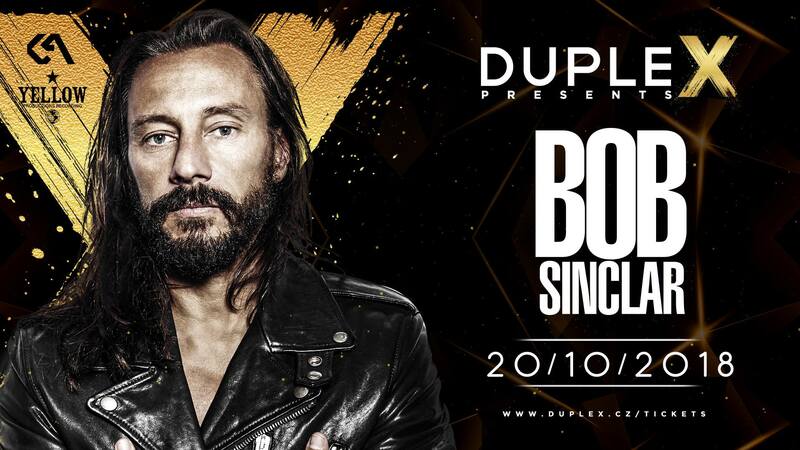 Bob Sinclar, the legendary French DJ and producer, returns to Prague on October 20 to spin at DupleX, The Rooftop Venue on Wenceslas Square, Prague after a twelve years absence, as part of the new concept night DupleX Presents, which is fast becoming famous for bringing the biggest stars of the world’s electronic music industry to Prague! Bob Sinclar is one of the longest standing figures on the international electronic music scene and has produced some of its most iconic house hits across an incredible career. For more than 20 years, Bob has been one of the industry’s leading figures with unforgettable hits such as Love Generation or World Hold On. Both these tracks hit # 1 in the world charts and above all, the Love Generation hit song has become the summer flagship of 2006. With eight full-length albums under his belt, a glittering discography that includes #1 hits and gold and platinum records, and a constant tour diary that features annual slots at Rio Carnival and Tomorrowland, his influence can be felt throughout all levels of dance music. In 2016, he forged a new musical partnership with mega label Spinnin’ Records, releasing ‘Someone Who Needs Me’ (20million Spotify streams), ‘Burning’ with Daddy’s Groove, and ‘Stand Up.